I decided to watch all three film adaptations of Little Women as a subset of my 25 Days of Christmas. I’ve seen them all separately, but this will be the first time I watch them in a small time-span allowing me to note similarities and differences in tone and presentation. I’ve seen the 1994 version just a month or so ago, so in this first review I’ll mention things in comparison to that film as it’s been over two years since I saw the 1933 version. 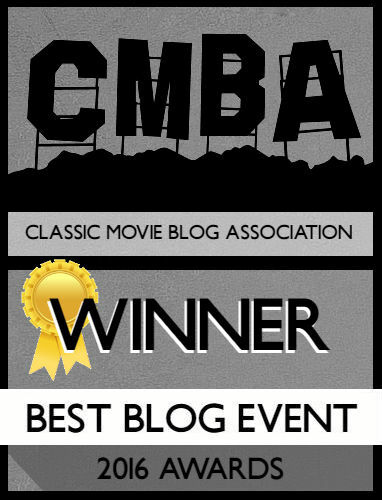 With that being said, I enjoyed this Mervyn LeRoy adaptation like I did the first time I saw it. The only drawback is June Allyson as Jo, but the rest of the cast is fantastic; particularly Margaret O’Brien, Elizabeth Taylor and Janet Leigh. The four March sisters struggle in 1860s Massachusetts after their father goes to war. Tomboy Jo (Allyson) yearns to write, and finds herself discovering a new friend in Laurie (Peter Lawford). Her sisters Meg (Leigh) and Amy (Taylor) seek material comforts, while little Beth (O’Brien) wishes to do good in the world. Little Women never fails to warm the cockles of my heart. I can watch it anytime of the year and it’s good, although I find myself watching the 1994 version the most. The 1949 version feels the most like a Christmas film, from the opening credits in cross-stitch to the snow-covered paths of the sets. More than the earlier and later versions, this feels like a Christmas classic in love with the simple things, like giving and family. The focus on one location, the March house, but also Jo’s house in New York, is evocative of director Mervyn LeRoy. I’ve seen several of his films, and they feel like stage plays, this one included. If you’ve seen any version of Little Women the plot remains the same, leaving the characters to sink or swim. For the most part, the characters are the best here than in the 1994 or 1933 version (I reserve the right to change that opinion once I revisit the 1933 version). 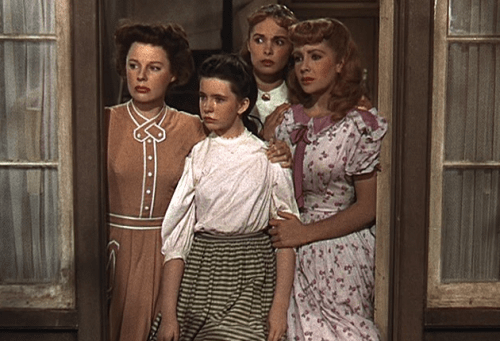 The 1949 version of LittleWomen, more than any other, gets me to love characters I normally hated. I don’t care for Beth particularly, but Margaret O’Brien made me love her. Similarly, I’ve never been able to stand the character of Amy! A lot of that has to do with how despicable they make her in the 1994 version. In this version, I found myself laughing heartily, and finding out Elizabeth Taylor could be quite the comedienne. In the original book, and in the 1994 version (I believe it’s the same in the ’33 one as well), Amy is the youngest. Making Amy the second youngest worked in this film’s favor because Amy isn’t as much of a petulant child as she is in the 1994 one. Taylor was 17 when she made this and between the blonde hair and garish make-up, she stands out. The Technicolor makes the make-up look fake on Taylor, especially since the other actresses have modest to none. It’s funny to watch Taylor play Amy since the character is in love with having a lavish lifestyle, and thinks she’s above others (she wears a clothes pin on her nose to make it pert). Art imitating life. The first half of the film, when the March sisters are going about their routine, allows for Taylor to show her comedy best. I especially laughed at her doing Jo’s play complete with crazy expressions. A running joke has Amy eating all the time which I can identify with! A lot of humor comes from those scenes, like the one with the popovers and the Hummel children (“one for you, one for you, and one for me”). Janet Leigh is also utterly gorgeous as Meg in this interpretation. She’s the oldest of the group, although June Allyson looks significantly older. A difference between this one and the 1994 interpretation is Meg actually gets a story! The romance between her and John Brooke (Richard Wyler) is developed well, although it all seems controlled by Jo who doesn’t want Meg to leave. Other differences I noted: Jo mentions her desire to be a boy as it won’t limit her dream. In the 1994 film Jo mention being a boy, but they feminize her more to compensate. Beth survives scarlet fever without Marmee’s help. I’m assuming they changed that one to promote motherly love, and the need for the family being the best medicine. I also loved how this version doesn’t create any animosity between Jo and Amy. In the 1994 version the love triangle between Amy, Jo, and Laurie is messy and incredibly selfish. There’s no selfish motives out of any of the characters in here. Jo and Laurie love each other, but Jo doesn’t want to get married. Laurie isn’t in love with the March family because they allow him to escape his staid existence; he loves them as his own family, Jo especially. When Laurie and Amy do marry, it’s out of love and Jo understands; there’s no need for competition between the sisters. At the end of the day they still love each other, and I think that’s a brilliant message to pass down to young women. I enjoyed Peter Lawford as Laurie, but he felt a bit stiff at times. The only problem I had with this version is June Allyson. For starters, she’s 32 playing fifteen. That’s quite a leap considering Janet Leigh was 22! Allyson looks far too old in the part, especially when she’s contrasted with the younger girls, and the Technicolor only highlights her age. She also seems to be playing the character the same way Katherine Hepburn did in the 1933 one. There’s nothing about the way Allyson plays the role of Jo that made me feel she embodied it. I kept saying “she plays a good Katherine Hepburn.” When the film veers into Jo’s adventures in New York I found myself tuning out because Allyson isn’t particularly interesting. 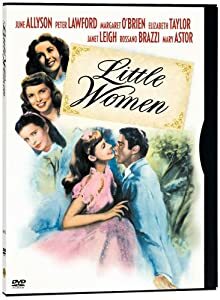 Overall, I enjoy the 1949 version of Little Women, and I would consider buying it to place it right next to the 1994 one. 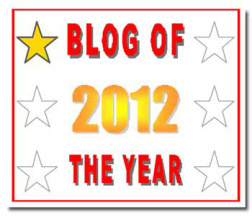 I love O’Brien, Leigh, and Taylor far more in this version than in any of the others. It’s a solid blend of humor and heart that never feels too sweet, or too tragic. Great review. This clearly isn’t my favourite version. But I like the colour. I never really understood the while Beth being younger thing. I see your point about innocence, but it was her innocent character, not her age and cuteness, that made her death so poignant in the original story. I also found Margaret O’Brien’s performance a bit stilted compared to Jean Parker’s in the Katharine Hepburn version. But you absolutely HAVE to see O’Brien in MEET ME IN ST. LOUIS because she’s absolutely ADORABLE!!! Haha, I figured. I will be doing the 1933 version towards the end of the month. From what I remember, Katherine Hepburn stood out the most (making June Allyson a pale imitation). Wow-Allyson was 32 playing Jo March? Unbelievable! Think of the other, much younger actresses who could’ve played that part. Boggles my mind! I just rewatched this and don’t hate Allyson as much, but yes she is far too old to be this defiant sprig of a girl. This is my favorite adaptation of Little Women. Despite the quirks in casting (June Allyson is clearly no teen), I loved seeing all of the accomplished actors working together. I think it’s neat that Mary Astor and Leon Ames played husband and wife, just like in Meet Me in St. Louis (and Margaret O’ Brien played their daughter in both films too!). I love this film! It is my favourite of the adaptations (with 94 coming in a close second). It is a warm and sweet film. It makes me smile, cry and laugh. It is so romantic too. I also like how you are made to feel as though you are watching a real family. I can’t stand the Hepburn version, in that everyone overacts so much, shouts, and I also found Hepburn irritating and even a bit wooden in some scenes. IMHO, 1994 version is the best. But I enjoyed this version.